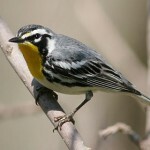 Description: Black-and-white striped head; slate gray back streaked with black; white underparts with black streaking on sides; black throat and upper breast; two white wing bars; and small yellow spot between eye and bill. 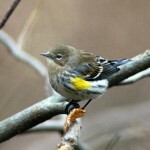 Female is slightly duller, and has less black on upper breast. Habitat: Migrants normally associated with dry slopes, thickets, and oak or pine woodlands. 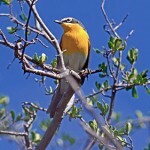 Where in Nebraska: Rare casual spring and fall migrant west; one spring record east. 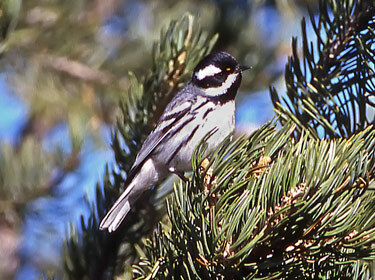 Field Notes: The drab colors of the Black-throated Gray Warbler is a good adaptation to the bluish gray-green of western junipers. Fun Facts: Has been recorded performing a distraction display, pretending to be injured to lure predators away.